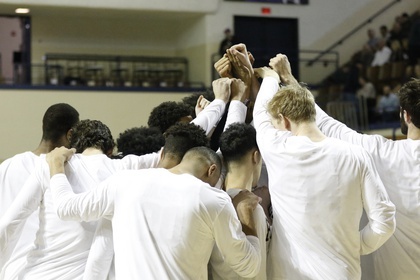 On Tuesday evening, Harvard men's basketball honored its six outgoing seniors and announced its captains for the upcoming 2019-2020 campaign. Junior forwards Seth Towns and Henry Welsh were voted to lead the Crimson, taking the reins from current seniors Weisner Perez and Corey Johnson. Towns, the Ivy League Player of the Year in his sophomore year, missed the entire 2018-19 season rehabbing from a knee injury. Holding career scoring averages of 14.2 points per game in 44 starts, the Columbus, Ohio native was given an AP All-America honorable mention at the conclusion of his second season, just the fourth-player in program history to earn the distinction. Welsh made four starts in his junior season, highlighted by a career-high, 15-point performance against Saint Mary's on Nov. 24. That outing also gave him COOP Athlete of the Week honors. Averaging 12.2 minutes per game this season, the Loyola graduate has shot just shy of 48 percent from the field in his career. Welsh has also been recognized off the court through being named to the CoSIDA Academic All-District first team. The Raymond P. Lavietes '36 Most Valuable Player Award was given to junior guard Bryce Aiken. The unanimous all-Ivy first team player finished the season tallying 22.2 PPG, the third-highest average in program history. Aiken recently added his name into consideration for the 2019 NBA Draft, while still preserving his collegiate eligibility. The Randolph, N.J. native also claimed the Henry Zimmerman Free Throw Accuracy Award, leading the team with a 85.5 percent clip from the charity stripe. Junior guard Justin Bassey was given Defensive Player of the Year Award honors for the second-straight season, while freshmen Mason Forbes and Kale Catchings shared the Hamilton Fish '10 Most Improved Player Award. Captain Weisner Perez was recognized with the John Harnice '84 Spirit Award. Junior guard Christian Juzang took home the Thomas G. Stemberg '71, MBA '73 Iron Man Award for most minutes played in the season, and senior Robbie Feinberg was honored with the Academic Excellence Award. The Floyd S. Wilson Sportsmanship Award was given to sophomore Danilo Djuricic. The Crimson closes the books on its 2018-19 season with its second-straight Ivy League championship and seventh in nine seasons. Its victory over Georgetown in the opening round of the NIT also gave the program its first-ever win in that tournament. Harvard returns nearly all of its scoring in addition to an incoming class highlighted by Massachusetts Gatorade Player of the Year Chris Ledlum, as it seeks a return to the NCAA Tournament for the first time since 2015. 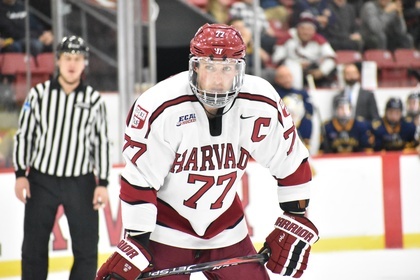 After a slow start to the 2018-2019 campaign, the Harvard men’s ice hockey team gained some momentum this weekend when it hosted No. 18 Arizona State for a two-game slate. Much of this success can be traced back to co-captain and forward Lewis Zerter-Gossage. The Montreal, Que., native earned ECAC Hockey Player of the Week honors for his efforts against the Sun Devils. He tallied four points on the weekend, which included three goals and an assist. This puts the captain at a team-leading five goals for the season up through this point. On Friday night, Zerter-Gossage’s assist and goal helped the Crimson secure a 4-1 victory. In the second period, after Arizona State had cut Harvard’s lead to one, a slashing penalty put the Crimson on the man advantage. An assist by Zerter-Gossage allowed freshman forward Jack Drury to restore Harvard’s two-goal lead less than 40 seconds into the power play. With less than four minutes remaining in the third period, the captain put the game out of reach. Seconds after killing off a hooking penalty, junior defenseman Adam Fox sprung Zerter-Gossage free with a stretch pass. On the breakaway, he went with a backhand shot and lifted the puck into the top corner to secure the win. The following day, Zerter-Gossage turned in another strong performance at the Bright-Landry Hockey Center. His first period power play goal gave the Crimson an early lead. At 4:22 of the frame, Zerter-Gossage backhanded the puck off a Sun Devil player and into the back of the net. The game was knotted at 1-1 when he struck again in the waning seconds of the middle period. Co-captain and forward Michael Floodstrand flicked the puck to the front of the net at a narrow angle, and Zerter-Gossage was there to tuck in the rebound, putting Harvard up 2-1. Despite the captain’s heroics and the fact that the Crimson outshot Arizona State 42-25, the Sun Devils came out on top with a 3-2 overtime victory. This is Harvard’s fourth overtime game of the season, and they have failed to win in all four (0-2-2). Zerter-Gossage will need to continue his sharp play if the team hopes to earn some points against No. 15 Cornell next Saturday. The Crimson will travel to the Big Apple to take on the Big Red at Madison Square Garden in this highly anticipated matchup. Junior Hunter Ladnier performed admirably at the Jonathan Kaloust Bearcat Open, where he tied for fourth overall in the wrestling team’s first event of the season. The 157-pounder was Harvard’s top point-scorer at the event. In his first match of the event, Ladnier was pinned by Lehigh’s Josh Humphreys. However, Ladnier would not let this loss affect him as he won his next five matches. His second match was against Lehigh’s Brian Meyer. To avenge his first loss against a Mountain Hawks wrestler, Ladnier won by decision with a final tally of 7-2. Ladnier would later beat Quentin Hovis of Navy. In this match, Ladnier won unanimously 2-0. Ladnier then faced Penn State’s Bo Piper. Ladnier would easily win again, defeating Piper with a final decision of 8-1. In his fifth match of the event, however, Ladnier faced his own teammate, Aaron Kruk ’20. Ladnier outscored Kruk by a numerous 16 points, winning by technical foul. Ladnier’s rebound after his first loss added great momentum to his level of play. Ladnier’s four-match winning streak pushed him to the consolation semifinals, where he was set off to face probably his toughest opponent, Cornell’s Adam Santoro. The two fought for a long time, each scoring a great number of points. Ultimately, Ladnier emerged victorious via major decision with a final score of 19-10. Ladnier eventually los to Navy’s Zachary Ervin in the third-place match. Thus, Ladnier settled for fourth place in a tie. Ladnier, who is ranked 37th according to WrestleStat, plans to have even a better season than last year. Last season, Ladnier finished with a record of 18-12, with a win percentage of 60%. This time around, Ladnier has started the season strong and hopes to continue his success in the next events. With fresh faces at Harvard and upperclassmen returning stronger than before, Harvard hopes to improve its No. 56 national ranking and capture the Ivy League Championship. Wrestling is scheduled to compete in the Keystone Classic in Philadelphia, Pa., on November 18. Until less than a month ago, senior quarterback Tom Stewart was not even starting for Harvard. A mere four weeks later, he has etched his name into the Crimson’s record books after turning in a five-touchdown performance this past Saturday in a 52-18 win over Columbia. The Dallas native overcame inclement conditions to tie the touchdown record set in 1953 by Carroll Lowenstein ’54 and matched in 2011 by Collier Winters ’12 and Colton Chapple ’13. It was apt that Stewart’s best performance came on senior day. He managed to throw for an astounding 393 yards despite completing just 15 passes. Among those completions were the three longest touchdown passes in program history: a beautiful 92-yard strike to junior receiver Jack Cook on the first play of the game, a 75-yard pass under pressure to sophomore receiver Tyler Adams, and a 74-yard lofted pass to sophomore running back Aaron Shampklin. All three touchdowns came during Harvard’s dominant opening quarter, after which Stewart had already racked up 251 yards passing. The Texan later slung two touchdown passes to fellow senior Henry Taylor, who racked up 105 receiving yards in addition to the two scores. Stewart had tallied 342 passing yards by halftime and had a chance to target the all-time mark of 448 (Chapple, 2011), but the wind put a damper on the passing game after the break. Nevertheless, the senior signal caller looked comfortable and confident throughout for the Crimson. Stewart’s commanding performance came after back-to-back weeks in which Harvard (4-4, 2-3 Ivy League) lost close games to nationally ranked Ivy League stalwarts Princeton (8-0, 5-0) and Dartmouth (7-1, 4-1). In seven games (four starts), the Crimson quarterback has now thrown for 11 touchdowns without a single interception. The senior is making his chance to quarterback Harvard count. He had thrown just 51 career passes before this season, all of which came in his sophomore season. The Lions (1-4, 4-4) improved after being blitzed in the first quarter, but they were never able to make a dent in the deficit, as the Crimson scored at least a touchdown in each quarter to stay comfortably ahead. In the end, Harvard racked up 496 yards of total offense en route to just its second victory since Sept. 21st. It would be very tough for Stewart to top his senior day performance, but he will look to maintain his exceptional play and the Crimson’s winning ways at Penn (3-2, 6-2) on Saturday and then against Yale (3-2, 5-3) at Fenway Park. With consecutive wins, Harvard would finish back above .500 after a rare 5-5 season in 2017. With the blink of an eye, junior Kieran Tuntivate raced past the finish line, inching out the Tigers’ Conor Lundy for a first-place finish at the Ivy League Heptagonal Cross Country Championship. The annual Ivy League Championships took place at Princeton’s West Windsor Fields on Oct. 27. With gray skies and a recent rainstorm leaving the course muddy and perilous for all the runners, the Ancient Eight nevertheless had its teams line up for the momentous race. With of time of 24:30.2 in the 8,000 meter race and an average mile pace of 4:55.7, Tuntivate became the first men’s champion since Maksim Korolev ’14 won in 2013. In addition to his spectacular finish, sophomore Hugo Milner also found himself in the top three finishers with a time of 24:32.3, slotting himself within a pack of four Princeton runners. After taking a season off last year and travelling to Thailand to both train and compete, Tuntivate returned this season ready to help Harvard break past its competition. As a freshman, he logged times of 25:38, 26:04, and 27:10.4, the latter of which placed him 77th in the Ivy League Heptagonal Championships in 2015. His sophomore season, Tuntivate placed 18th at the Ivy League Heptagonal Championships, running a time of 24:16.8. Overall, his best finish of the season was at the Harvard-Yale-Princeton meet with a 10th-place finish, and his fastest time of came at the Paul Short Meet where he ran an astounding 24:13.3. This year, Tuntivate led Harvard to a second place finish in the Ivy League Heptagonal Championship, the best finish the men's team has seen since 1976. With the NCAA Northeast Regional and National Championship meets coming on Nov. 9 and 17, Harvard should feel confident, yet with room to improve.